dpn | Oh! What a wicked web we stitch! I decided to post early this week. I have been so far practicing a lot this week. Well first off check out this beautiful yarn I bought. I got it on eBay (I have a link to the seller in my side bar under “Spinning the Web”. 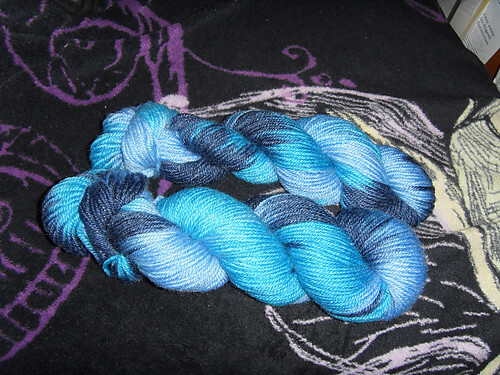 I was browsing eBay and fell in love with this hand dyed wool yarn. I won the auction at $6.15 for 250 grams. I don’t know what I will use it for yet, it will be saved for something really special though. For those of you who don’t know, I crochet hats and booties in memory of my daughter Alana who was born too soon and passed away. That is why I taught myself to crochet, and now to knit. You can visit my website that talks a little more about what I do at Precious Awakening (a pregnancy and infant loss website). I donate them to the hospital where she was born. 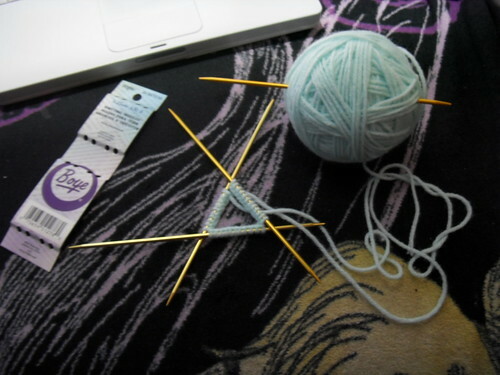 I decided that my first project with DPN’s should be a hat for this purpose. I picked up a set of DPN’s from Walmart which only cost me $2.36. I used Lion Brand’s Pound of Love in Pastel Green. I watched a quite a few videos on YouTube before attempting to do it myself. It’s a micro-preemie sized hat (for a baby weighing less than 1 pound), it measures 2.25″ with the brim folded up (3″ unfolded). It turned out okay considering it was my first time but I think I can do better. I found myself knitting very tightly which made making this very hard. It took forever! The pattern I used can be found here and here is the link to it on Ravelry. 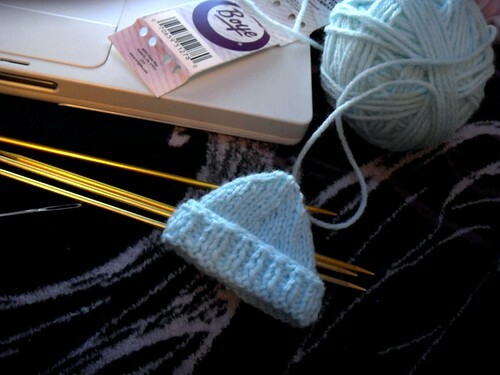 I’ll be making this hat again, but I think that I will wait until I am a bit of a faster knitter. It literally took me almost an entire day to complete! Anyway that is enough for now. I will write again later on. Today is my birthday.